ESA's Proba-2 satellite experienced 3 partial solar eclipses during the total solar eclipse of Nov. 13, 2012 (EST). This image is taken from a video made by the spacecraft. A European satellite has captured video of the moon blocking the sun, as seen from space, during a total solar eclipse that wowed huge crowds of spectators who watched the event from Australia yesterday. 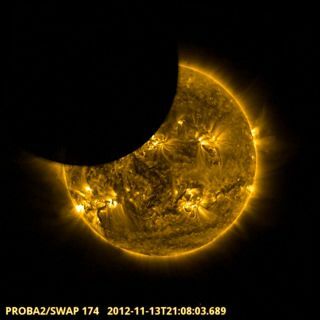 The solar eclipse video from space was recorded by the European Space Agency's Proba-2 satellite. While the spacecraft did not record the totality of the solar eclipse, it did see partial views of the eclipse three separate times, ESA officials said. The total solar eclipse of 2012 Tuesday (Nov. 13) attracted nearly 50,000 spectators to northern Australia to witness the moon pass exactly between the Earth and the sun. Because of time zone differences, the dazzling celestial sight occurred around dawn Wednesday local time in Cairns, the focal point for many observers. "The satellite also spent hours collecting data of the solar environment further away from the sun before and after the main eclipse event, providing context for the ground-based observations," ESA's Proba-2 mission manager Joe Zender said in a statement. The satellite's ultraviolet measurements of the eclipse can serve as a reference for astronomers on Earth, who used the solar eclipse to take rare visible-light observations of the sun from the ground, ESA officials said. “Combining visible light observations with the extreme ultraviolet images from Proba-2 gives us a unique opportunity to access difficult-to-see regions of the sun at different wavelengths, during a rare event such as a total solar eclipse,” Zender added. Proba-2 orbits the Earth 14.5 times every day and actually passed through the moon's shadow during the solar eclipse, which caused a dimming effect in its video of the event, ESA officials said. As the satellite tracked the eclipse from space, Proba-2 mission scientists watched the celestial event in person from northern Australia. "We got all a bit nervous when after sunrise the partially eclipsed sun was covered by a big cloud, but five minutes before totality, the cloud dissolved and we could watch 'Baily's beads' form – the effect where beads of sunlight shine through the rugged lunar landscape," Proba-2 scientist Anik De Groof said. De Groof was among the thousands of spectators who watched the solar eclipse from Palm Cove on the Australian coast. "At totality we could see the red chromosphere and the corona in the most beautiful conditions — it was fantastic!" De Groof said. Tuesday's total eclipse was actually the second solar eclipse of the year. On May 20, the moon passed between the Earth and sun, but did not completely cover the solar disk. The resulting annular eclipse created a so-called "ring of fire" effect that dazzled millions of observers who watch the event from parts of Asia and North America. The next solar eclipse will occur on May 10, 2013. Like the May 2012 eclipse, it will also be an annular solar eclipse and be visible from parts of Australia, eastern Papua New Guinea, the Solomon Islands and the Gilbert Islands in the southern Pacific Ocean. Meanwhile, on Nov. 28, the moon will pass through the outer portion of Earth's shadow, called the penumbra, during a penumbral lunar eclipse. Observers in western Canada and the United States will have the best views of that event.